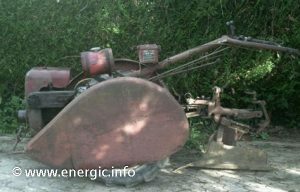 Energic motoculteurs where ideally suited and adapted for work in viticulture, later the 509, 510, 511 and 512 vigneron tracteurs where developed to cater for larger vineyards and the greater demands of mechanization. The motoculteurs width could be modified from over a meter wide to less than 57cms to deal with the specific demands of viticultue, as well as difficult terrain on many hill farms -slopes, depths. 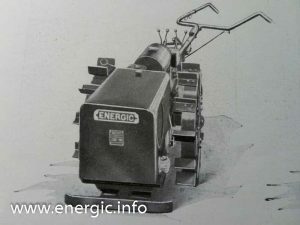 The first Energic motoculteurs used in vine work where the Energic B1 (later the Energic B5), then the Energic C7 B4L and Energic D9 5BL. Latterly in late 1933 the Energic S bloc C7 and D9’s. 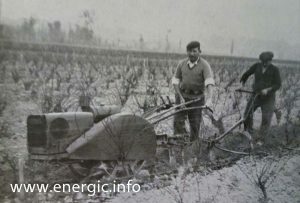 Energic motoculteur C7 4BL fitted with Bavolets Vines ptotectors with ploughHere we have a 1930’s photo of a Energic motoculteur C7 B4L adapted for vine work with “Bavolet protecteurs”, – wheel protectors to prevent damage to the vines as the moteurculteur passes. “. This Energic motoculteur C7 B4L is towing a single plow followed by a harrow system that required an extra person to guide the equipment (direction, depth).The air filter is positioned above the engine cover, normally protected in the engine cover, due to the dusty nature of the work. The wheel weight where positioned inside the wheels, to reduce the width. There is a extra bar for steering (see below adjustable steering option on later models). This photo shows the wheel protectors, wheel weights inside, reduced width wheel settings,fender bar extensions from the front to the wheel protectors – but in conjunction with a adjustable steering unit. This enabled the Energic motorculteur operator to work at a angle left or right with further adjustment for height. A single plow was enough for work between the vines, due to the close proximity of the vine rows. (between 70cm and a meter in width). Very few of these specialized fender protectors survived. 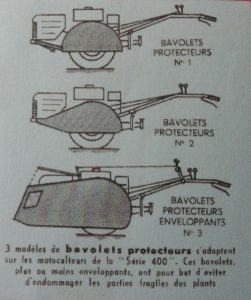 After the war the Energic 409 flagship motoculteur could be fitted with Bavolets for vine work (later available on the whole of the 400 series; 410, 411 and 412 motoculteurs). 3 types existed. No.1; just the wheel its self, No. 2; the leading edges on to the wheel and finally No. 3; the all enveloping “enveloppant” protector which streamlined the whole machine for easy passage through the vines and close orchard work. the option 3 means that some of the lever controls needed to be routed over the fuel tank. Energic motoculteur 409, 410, 411 and 412 with Bavolets. I have seen wire protectors on Mototracteurs 712. They constitute thick bent wire from the front on the mototracteur to across the wheels to the rear. Bolted to the front weight. Later on the Bavolets where available across the growing Energic motoculteur ranges including the 200 series.